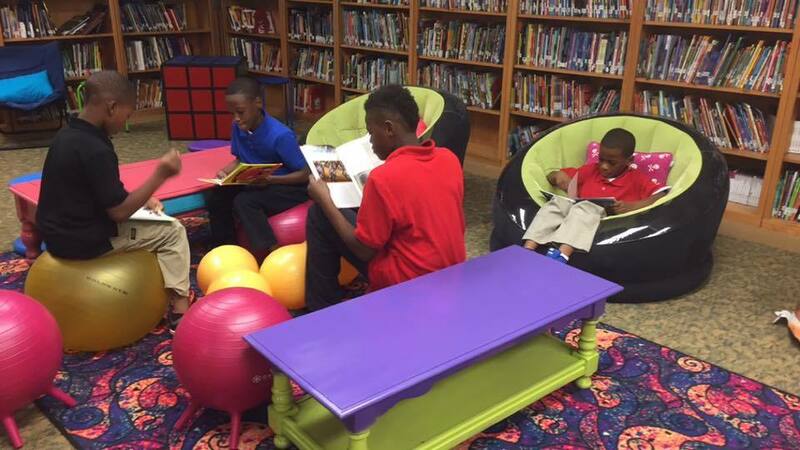 Blytheville Elementary School students are spending time with their books in furniture that’s more accustomed to what they have at home than what is normally found in a classroom. Although the jury is still out on the long-term effects the furniture will have on the students’ studies, the immediate effect on those students’ comfort is extremely positive. In three words, they LOVE it. The flexible seating furniture was paid for with money from the school’s spring book fair. Dogan picked out the furniture, and it was all either purchased from Amazon or Walmart, or donated from various community members. Dogan chose items that she researched and found to be kid-friendly and durable. Flexible seating options include a chaise lounge that was covered with neon duct tape, two blow-up chairs, two “wobble stools” that allow children to rock slightly back and forth without being distracting, six yoga balls that students can either sit on or rock their feet on, two “peanut balls” that are filled with air and allow students to rock and/or bounce, three butterfly chairs, hamburger bean bag, two retro chairs, six stools, zebra chair, two coffee tables, three end tables that have been spray-painted neon colors, a tent and jumbo-sized bean bag. Dogan said that the students were “very eager” to sit on the furniture when it first arrived, but that she spent two weeks teaching them what is and is not appropriate regarding the furniture. Even then, she added the students had to earn the right to use the furniture. “Each piece of furniture has its own rules and procedures,” she stated. “For the students, there is no running, no jumping, no moving the furniture, no picking up or throwing the balls, no closing of the tent doors, no feet on the bean bag, and no distractions by bouncing too high or rolling around.” Any students who violate the procedures will forfeit their fun furniture time and must earn that time back. Above all else, she stated that each student must be reading when he or she sits in the flexible seating furniture.